As a triple option team, Kennesaw State lives by its bread and butter, the inside veer. But every team runs into trouble once in a while. When KSU can no longer get 4 yards on the inside veer they have to have an answer to the defense. There are two constraints that the Owls can go to depending on what the defense is trying to take away. The play-action pass and the rocket toss. When the Kennesaw State Football team is having trouble running the Triple Option, it is usually because the opponent is selling out to stop the Inside veer. The defense is playing with a safety coming up hard in run support, and the defense is more worried about stopping the run than anything else. This is as much a part of the triple option offense as any other play. The Owls know that in order for them to be great and still move the ball they need to be able to throw the ball over the head of the defense. This works in two ways, they can score quickly, and it will back the defense off so they can continue to dictate the game. 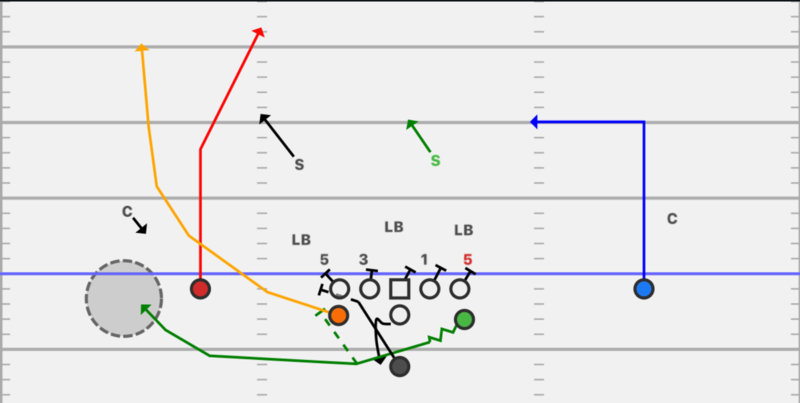 The key to running play action is to make it look like a running play, in this case Inside Veer. In the first clip we will see this executed against a 2 safety look, however in this case both safeties are flanked off the Mike and only about 5 and 6 yards off the ball. This look with the safeties below the hard deck gives the Owls the shot they want. Here you will see the play-side safety try to take that PSA back when he arcs outside and run with him on the Wheel route. The defense is in man coverage. The backside safety runs with the motion. This look gives the quarterback a pre-snap read of no one in the middle of the field. The PSWR in this case if it were an inside veer play would block the deep defender, who would have been the man cover corner. As the PSWR presses off the ball, the play appears to the corner that the WR is going to block him just as on Inside Veer. With the man coverage the QB reads the WR beating the S and throws over the top. 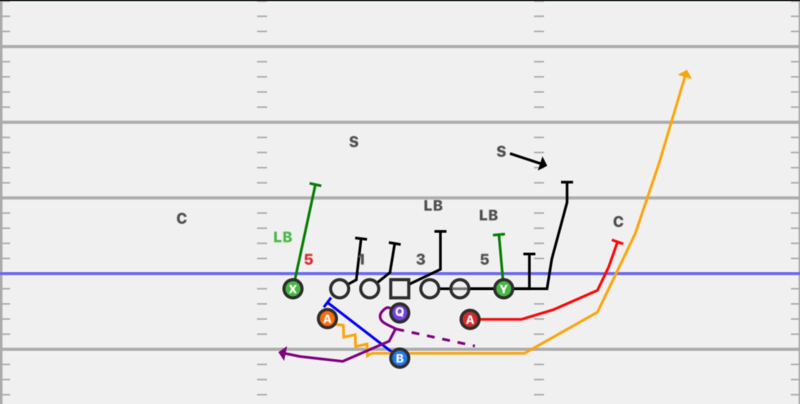 The second play-action switch route is against a more traditional 2 high safety look. On a typical Inside Veer play the PSWR would take the deep defender who is the PS half field safety and the PSA back would take the run support player, in this case the rolled up corner. The start of the play looks just like inside veer. The PSWR runs up field and as the near safety steps up the WR continues to run right past him to a skinny post. Because the safety stepped up on the play the WR gets an outside release on the safety. The PSA back arcs like he would block the hard corner. The corner comes up to force the play and the PSA back runs right by him and wheels up the sideline wide open to catch the ball for a touchdown. The rest of the assignments are as followed: The quarterback will take the same two first steps as if inside veer was being run. Without getting in a hurry, the QB will flash the ball and then push off the front foot and drive step to the play side, he will then cross over and one more drop step, the flip his hips and get both feet in the ground ready to deliver the ball. The timing works to look at the post first and then hitch up to throw the wheel if the post is not wide open. 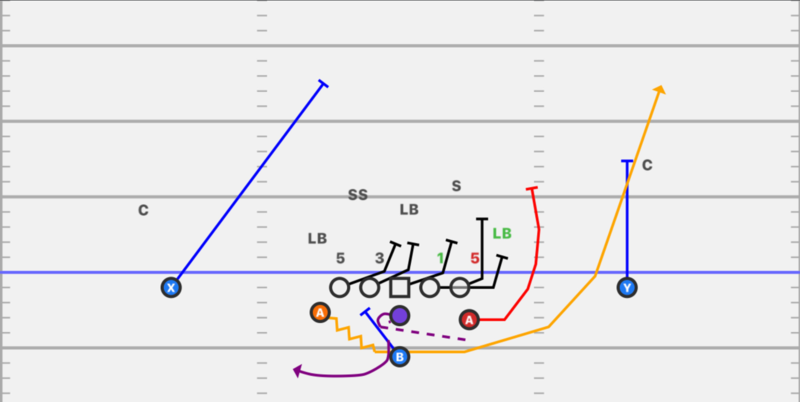 The B back will take the play fake like veer and look to block the play side B gap to outside. The back side A will go in motion just as in inside veer and either help secure the edge or turn up in the flats for a check down. The offensive line needs to come off the ball with low hats and give a good run look. They can be very aggressive. This will sell the LB’s and safeties on the run. The play side tackle mans the DE and the rest block their backside gap. If there is a 3 technique and 5 technique on the play side, the play side of the offensive line would block man and the rest would block down into the gap away from the call. The B aback would be responsible for the backer inside to out. There are a few scenarios where the rocket toss is the answer to the opponent’s chess game. First off all with the inside veer being the play the offense is centered around, KSU will keep running it if they are getting four yards a carry. But if they get a give read (meaning the player that the QB is reading is playing the QB and not the dive back) and cannot get 4 yards, it is time to get the ball on the perimeter. This is because the defense is forcing the offense to run inside and are putting more run support inside to stop the dive. Meaning the defense is messing with the quarterback. The DE knows if he does not take the dive, the quarterback should be handing the ball off and the defense can count on that and overload the inside. When this happens, it is a great time to toss the ball to the perimeter. The first look that we see from Kennesaw States film is a spread look against a 4- defense with a safety rolled down in the alley pre snap. The play side LB and DE do a gap exchange where the DE would have given a give read on veer. The beauty of tossing the ball outside is that DE of 5 technique doesn’t even have to be blocked. If the pitch is in the correct place (1 yard outside the tackle) and the tackle gets an outside release the DE is irrelevant and cannot make the play. The blocking assignments are the WR has the deep defender, the PSA back will arc and block the overhang player, the rolled down safety or extra backer here. The PST gets an outside release on the DE and looks for the Mike to the FS, whoever shows in the alley first. The guard pulls and in this case picks up the blitzing backer. The center and the backside line scoop to the play side gap and look for the second level. The second look is KSU’s double flex or 2 tight end look. Here is a great way to lure the defense inside. With only the corner outside the flexed TE and the half field safety right over the top of that same player, KSU knows they will have immediate leverage. The PSTE will block down on the LB stacked on the DE which is a crush block. The play side tackle and guard are both pulling on this play. The tackle is looking for the first to show in the alley. The guard is following to the alley and picking up the next to show. The PSA back will automatically arc to the corner with no one left outside. The Backside will again scoop. In both cases the B back will fill on the backside of the play, blocking the BSDE. The QB will take a hammer step and turn his heel out towards the pitch, he will then open up and throw a hard knuckle ball to the A back who will catch it 1 yard outside the tackle and stay outside and look to get the corner and run has, numbers, sideline for a touchdown. The QB will boot away from the toss. Terry Donovan is a Master Trainer for USA Football’s Heads Up Football program. He is the offensive coordinator and quarterbacks and B backs coach for Kasson-Mantorville High School in Kasson, Minnesota. He has coached with the U.S. National Team Program. He is also a youth coach and Director of Youth Development in the Kasson-Mantorville Youth Football Association.